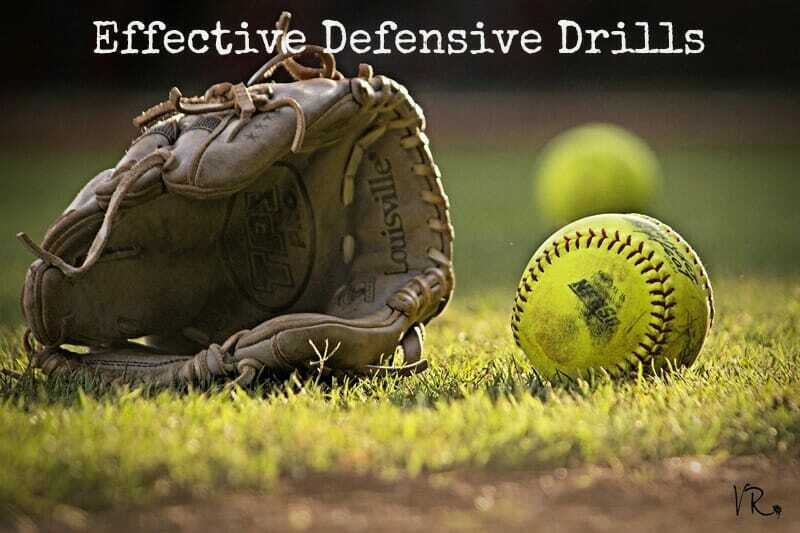 Today we’re going to introduce some fundamental fastpitch softball drills for the defense. The drills are going to incorporate a lot of ball handling, and will make you really focus on the fundamentals of being a good fielder as well as making sure that you can throw strikes to your target. Before we get into the actual drills, I want to talk a little bit about getting into the proper fielding position. One of the most common things that we do wrong is we’re not in a good fielding position to receive the ball. We want them in a good athletic position so they have a nice wide base and they’re on the balls of their feet. They’re cracked at the knee and the hip. They’ve got a straight firm back, the head’s down on the ball, and they should be fielding the ball out in front in what we call the tip of the triangle. If you were to draw an imaginary dot on each toe area and then fully extend into the fielding position, you would have a tip of the triangle. Our fielders receive the ball at the tip of the triangle. Out in front, away from the feet. This first drill helps the fielder work on setting up a good athletic base and fielding the ball out in front. Now not all players are the same size so, as a coach, make sure you have enough cones to set up for the shorter players versus the taller ones. Taller players have, obviously, a wider base and a longer reach. Both players approach and put down an imaginary triangle, which you should mark with the cones. They’re going to work on their approach and line up in setting up on the triangle. Place the cone on the inside of their triangle. Now we have the players step back and work on their approach to the ball, stepping in to a good athletic position when fielding the ground ball. They approach, step, extend, catch the imaginary ball, step out of the cones, and come around and do it again. Based on your stamina, you can go ahead and dictate how many repetitions they go through. This drill forces the fielder to use both hands when receiving the ground ball. They receive the ball out in front, the bare hand meets the paddle hand, and they catch the ball and bring it in to the throwing area. The players are approximately 15 feet away from each other, throwing the tennis ball back and forth. Be sure to remind them to receive the ball out in front, keeping their head down the entire time. 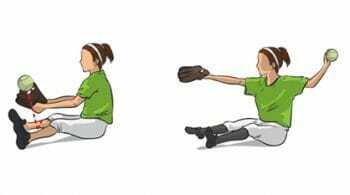 Now let’s do a variation of this drill, where both players have the paddles and the tennis ball, and they’re going to work on their fielding mechanics: wide base, athletic position, a nice bend at the knee and the hip, fielding the ball out in front. Now they’re going to be standing simulating more of a real defensive fielding position. Some players like to be square with both toes evenly separated. Other plays like to have their glove foot slightly in front when they field the ball. Our goal in this drill is to make sure that we’re fielding the ball at the midline of the body, keeping the head down, and most importantly, keeping the bottom down. Many girls have a tendency to field the ball with their bottom up high, so we work on using our quads when we’re fielding the ground ball. Let’s do one more variation of these drills. 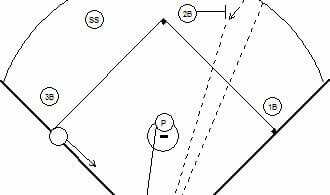 Instead of a routine ground ball, they’re now going to take the in-between and turn into a short hop. The in-between ground ball is one where the fielder has a tendency to attack and then she lets it eat her up. She fields the ball up high and her weight goes back. 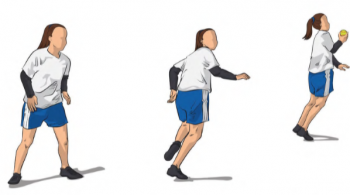 This drill is going to help you turn the in-betweener into a short hop. Most people that play softball will use anywhere from an 11¼ glove to a 13-inch glove, depending on the position. What we do with this drill is use a smaller target and a smaller ball, whether you’re an infielder or an outfielder. We use anywhere from a 10¼-inch glove to 10¾-inch glove. And it’s a great experience for them because it forces them to stay down on the ball because you’ve got the short fingers, and the small ball represents a smaller target, so their hand-eye coordination needs to be more precise. The first part of this set of drills involves your defensive players fielding the ball out in front on their knees, using the small glove, small ball. If your players are just learning to field the ball out in front, you can have them mark an imaginary tip of the triangle so that they know that they have the ball out at the tip of the triangle. That way they’ve got a marker to go on. Using the training gloves and the training ball, we’re going to do a variation of this drill, where they’re going to start manipulating the hand on the forehand and the backhand. They’ll do a series of forehand balls and then a series of ground balls where they’re going to turn their glove over and work on their backhand. This next drill is another variation where they’re going to work the in-betweeners–taking that in-between ball and turning it into a short hop, out in front of the body. Charging and attacking on defense. The key to this drill is how they keep their torso forward on the ball. They don’t have a tendency to pull up or pull their head up when fielding. This is going to enable that infielder to go ahead and attack that in-betweener. 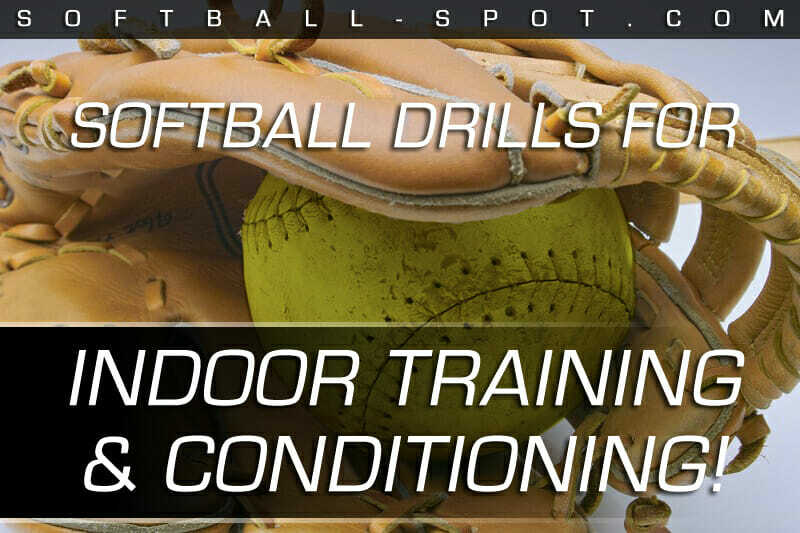 These fastpitch softball drills will be great work for your defense. If you agree, don’t forget to share this post with fellow coaches and players! 1 Response to "3 Defensive Drills to Help Your Players Get Ready for Game Time"
These instructions would be more helpful with photos to support them. Some of us are very visual.